I was hit with the reality of this trip today. After two days of interviews around DC, we were thrown into the heart of the city. 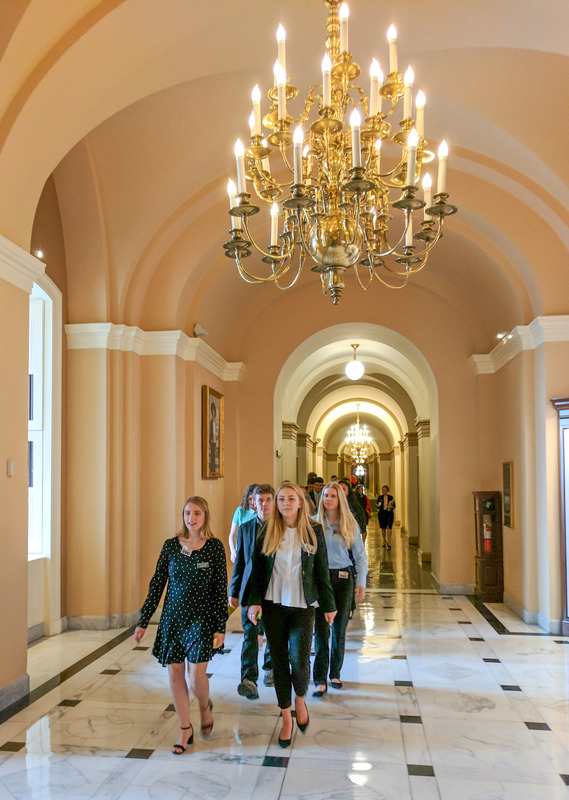 We found ourselves in the Capitol Building, carefully walking through marbled hallways, seeing pictures, paintings, and statues of various legendary political figures with every step we took. We kept walking by signs that said, “No Tours Beyond This Point,” and I kept wondering where we were going that was so exclusive and how we were getting such access. After walking through a few metal detectors and having my mind blown too many times to keep track, a security guard outfitted with the classic earpiece/extra-dark sunglasses look stopped me and gestured toward a large door. I used all my strength to open this door, and on the other side I saw the chamber of the House of Representatives. The actual one! Just like in all the videos and pictures I had seen before, except I actually got to be there. We sat up in a balcony, watching this famous room full of famous people voting on and debating a bill that addressed agriculture, veterans, and food stamps. In a way it reminded me of going to a Warriors game, seeing something I had seen many times, but never in person. Being there makes you realize how real it all is, in a way that a screen just can’t communicate. It hit me right then that all these people are really spending all day making decisions that can end up affecting an entire country. Sure, I knew that before, but now I was watching it with my own eyes. 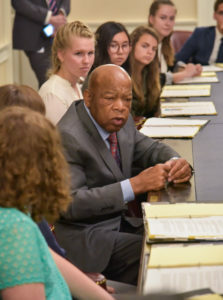 Not long after, I was sitting across from one of the most prominent figures from the Civil Rights movement, John Lewis. I had that exact same realization while he was describing his experience of the Selma March. I began to wonder how different the world would be if this man had never existed, if he had never been an integral piece of one of the most important movements in US history. I was so enthralled that I forgot to take notes. I wish I could remember more of what he said, because it was all just as amazing as the experience of meeting him. Either way, I spent a day in a place I will likely never return after this trip, and I met someone that I will always remember meeting. Today? Not bad. 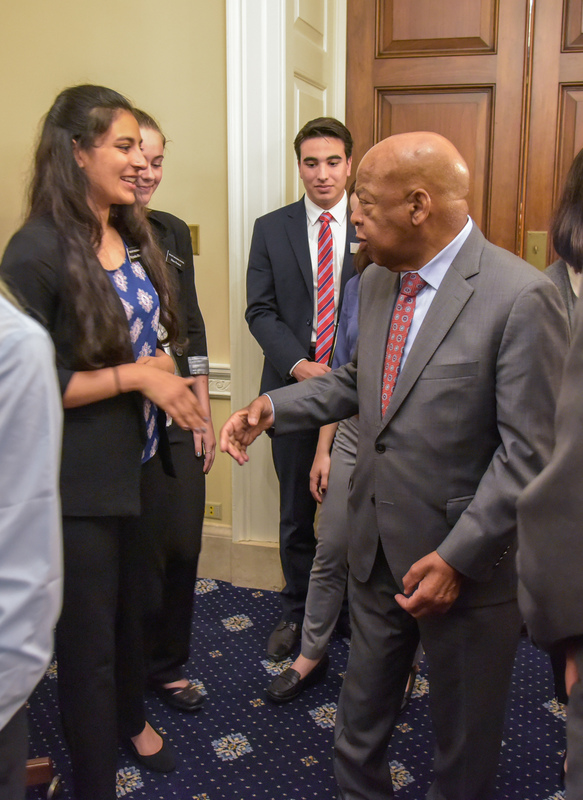 Before leaving for Washington DC there was one interview I had been looking forward to and anticipating the most: Congressman John Lewis. With my mother as the History and US Government teacher at my high school, I’ve learned so much about him and how important he was throughout the Civil Rights Movement. When he walked into the room, everyone’s eyes lit up. When he sat near me my heart was pounding, seeing him up close, and I couldn’t believe he was real. He was such a warm and beautiful person whose words and voice soothed and inspired everyone in the room. When he shook my hand, he looked me in the eyes, and all I could think about was how much history and extraordinary experiences his eyes have seen. I will never forget the incredible stories and words of wisdom he told. I could not take my eyes off of him the entire interview, not even to take notes. I wanted to savor his presence because I’ll probably never get the chance to witness him again. Earlier in the day we went to the chamber of the House of Representatives and got to watch members of Congress debate and vote. Seeing this was another unforgettable and incredible experience. The room where this is held is a room I’ve only seen in textbooks. I couldn’t believe I was really in there. The room was exciting and full of so much energy. Everyone was passionate as they debated their side of the issues. When the votes were being counted we were on the edge of our seats, waiting in excitement and nervousness for the outcome. We had become completely immersed into the world of politics and debate. Although we have many more days on this incredible journey, I know that this day in particular will be one of the most eye-opening and unforgettable. Today was by far my favorite day in DC and definitely one of the best days of my life. The day was arranged semi last minute, leaving room for many surprises. We started the day off by going inside the Capital Building, where we watched the voting process on a controversial bill called the Farm Bill. It took a while to enter the chamber of the House of Representatives to witness the vote, and I didn’t know what to expect. We walked through the door, which I thought led to another room we had to go through, or another staircase. However, it was the voting gallery full of members of the House of Representatives. I walked in, my jaw hit the ground, and I froze. I have never felt that way before. I sat in the front row of the balcony and looked down, trying to spot any members of Congress I might recognize. It was absolutely amazing, and still is amazing, that I was in the same room that I’ve seen on television and in photographs, a room where so many big decisions are made. The debate of the Farm Bill began, and it was incredible. After the debate, we got to see the voting process live in action. This made my day. After sitting through the debate, we went to interview Congressman John Lewis. 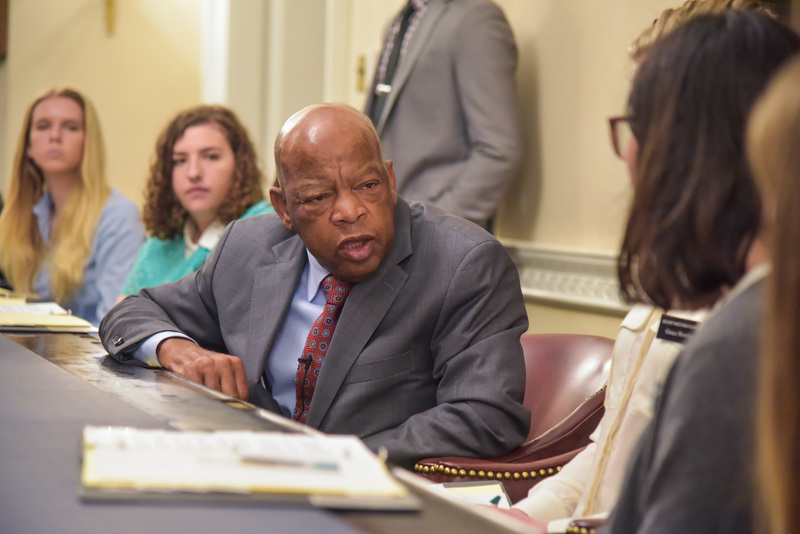 John Lewis was in the middle of a meeting in the Ways and Means Committee, and we had the opportunity to sit in and watch for a brief five minutes. At this point, I was speechless. I had just been inside the House of Representatives to watch a live vote, and now I was watching the Ways and Means Committee in session, and I still had the Interview with John Lewis to look forward to. We assumed, based off of Lewis’s tight schedule, that we’d get no more than four questions in. Fortunately, we got to ask ten questions. Similar to our pre-trip interview with Secretary George Shultz, I had a difficult time fully realizing whom I was sitting across from and listening to. 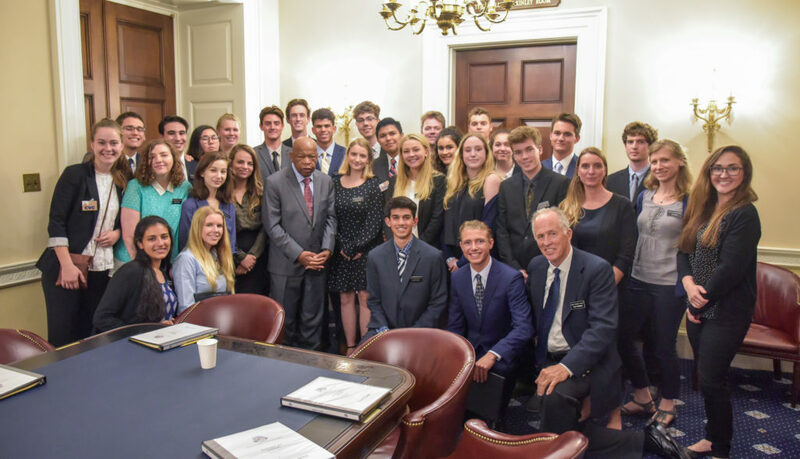 Lewis’s life experience differs from other Congressmen. He is a man dedicated to persistent service, no matter the cost, in the name of justice. I was looking at the same man who helped change US history, and who marched beside Dr. Martin Luther King Jr.
Lewis said that change comes with an interesting combination of “history and fate.” What I got from this was, we know deep down when it’s time to fight for something, and to act on that knowing means that you are leaving this country a better place than it was before. He also told us, along with everyone else we have interviewed, how important it is to vote. He said, “Why do you think people try to stop others from voting? Because it’s power.” People underestimate the power of an educated and engaged country that partakes in a democracy. We have all the tools; we just need to use them. I will always remember today as one of the best days of my life. 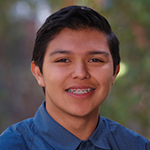 Politics is my main interest, and is definitely the field of occupation I want to enter. Today enriched my desire and passion for politics. Walking through the Capitol Building today and seeing where the decisions are made that affect the whole nation was surreal. We walked into a room with a long table and waited for John Lewis to come in. We didn’t know what to expect or if he would even have time to answer our questions. Luckily, he was able to sit down with us and give us a glimpse of the knowledge that he has accumulated after 50+ years of activism. When I asked John Lewis my question about how we could keep our moral principles in times of crises, he looked me in the eyes the entire time he gave his answer, the same eyes that “saw the face of death” on Bloody Sunday in Selma, Alabama. He expressed how we as young people have the power to change the very fabric of our nation, but we must vote. If we truly believe in something we have to be unwavering in our dedication to the cause; we must always have the strength to keep fighting no matter how many obstacles we face. We have to elect people that represent us and the things we are fighting for; we must have diversity of views and perspectives. I could tell from his answer and eye contact that he thoroughly believed in every word he was saying. He wanted so desperately to pass on this message to the youth of the nation, the message of non-violence, love over hate, and importance of community. His answer struck a chord with me. As a young person newly able to vote, I cherish our democracy. We can truly impact our nation and its perception of our people and the world. We have the power to progress views and ideals to a place that comes from love, understanding, and open-mindedness. While we were guided through the gilded marble halls of the Capitol, I felt as though I might want to join the DC political scene for the architecture alone. High ceilings intricately adorned with stars, sky, and historical events; hand-painted tile floors; narrow, spiraling staircases. It would have been easy to get lost among the sculptures if there weren’t a long line of us, single-file, clinging to the white walls as we made our way towards the Ways and Means Committee where Congressman John Lewis was working. Our guide led us to a conference room off to the side of a meeting. 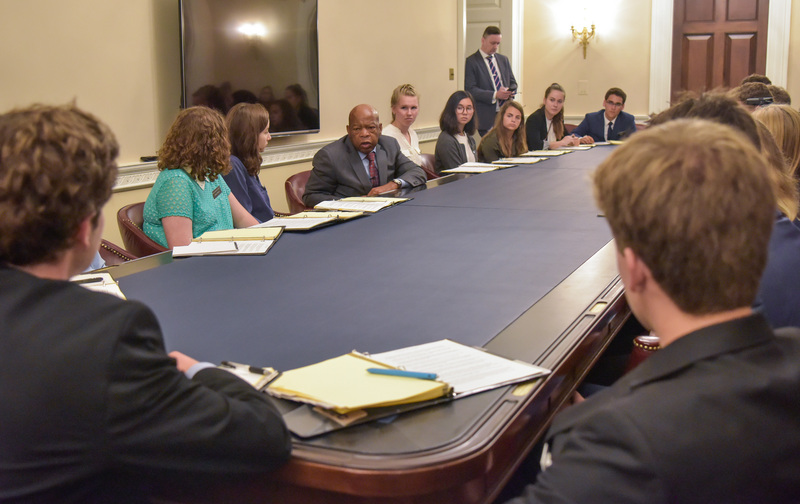 This was the first time we were allowed to situate ourselves without knowing where our interviewee would be seated, and I had the luck of sitting one chair away from Congressman Lewis. 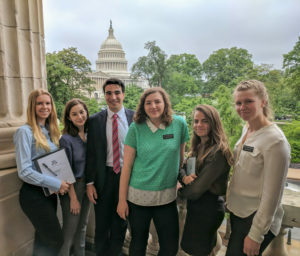 One of the strangest feelings on the DC trip is recognizing someone’s face from research rather than having met them in person. It was especially strange seeing someone who had been the subject of so many books and documentaries, who had made such a large contribution to the progression of civil rights in our country. When Congressman Lewis first entered the room, my mind immediately went to a tweet I had seen, showing Lewis leading a sit-in during the 60’s next to a photo of him staging a sit-in at the White House two years ago. Making prolonged eye-contact with him as he answered my question was also strange, along with trying to restrain my stomach from jumping into my throat as I eeped out a small “thank you” when he finished speaking. One of the most powerful aspects of our time with Congressman Lewis was “with belief comes engagement.” He was only a little bit older than us when he was first arrested for his activism in the early 60’s, and has continued to fight since then, even as he is the last living of the “Big Six” of the Civil Rights Movement. He has managed to stay motivated by his optimism and hope in the good of people, particularly youth. As a young person given access to the right to vote in such a turbulent political climate (where at times it feels my voice doesn’t matter), hearing the emphasis on hope as a means of perseverance from someone who has changed so much in this country for the better against enormous odds is reinvigorating.